Polish your casements with a fresh cleaning method that has met the demands of over 94% of our clients in Belgravia! Q: Who will be tasked with washing my panes? A: Your panes will be washed by a team of verified and reference-checked window cleaning technicians. Q: What services does window cleaning Belgravia cover? A: The cleaners will achieve exterior window cleaning with the help of present-day water-fed pole equipment on the market. For premises above the fourth floor, we'll send in experienced abseilers for rope access window cleaning. For inside pane polish, the team will employ standard ladders and sponges. Q: Can you still deal with smeared dust on a rainy day? A: A few of raindrops won't disrupt the Belgravia window cleaners' work – rainwater is usually deposit-free. However, if we face a rainstorm, then we will kindly ask you to suspend your appointment for another day. A: Yes, any PVC or UPVC frames and sills that your premises features will be cleaned with no extra charge as part of our service. A: As long as the cleaners can walk past your front gate, they can blast away all grime without you having to be around. If your panes need a meticulous inside polish as well, then we'll arrange a fast key pick-up and delivery service. A: Usually, the distilled water tank inside the team's washing van is always full. In case the tank is empty and with your permission, the specialists can painlessly connect the water-fed rod to any available water source. A: Once we tell you that the team's en route, you'll need to ensure that they can enter your domain unimpeded. In addition, the specialists will need a parking spot within 30 metres from your property and on the same side of the windows you want treated. A: If the team is nowhere to be seen because of intense traffic, we will inform you about the delay and get in touch with you as soon as they arrive. After going through lots of customer feedback, we've altered our window cleaning Belgravia's charges. Now, you can hire our service at prices that are nothing short of reasonable! For further information, please check out our price table below. With window cleaning in Belgravia, we can better the appeal of your premises even if it scrapes the clouds above. Let's look at what you'll get once you book our flexible service. For outer window washing, the Belgravia window cleaners will make use of a telescopic water-fed pole. A water pump inside the specialists' van will deliver filtrated water up the hose and out of a brush-head attachment. The water, together with the brush-head, will undo any traces of mud from the windows of any four-storey building. With rope access window cleaning, the pros will use safe climbing tools to reach even the uppermost floors in your industrial or residential property. We possess all needed COSHH documentation and risk assessment reports and can send them to you in no time. Also, we regularly check the cleaning gear to ensure that your appointment will go without a hitch. And to wipe every inner corner of your panes, the proven team will use the regular squeegee and ladder cleaning method. 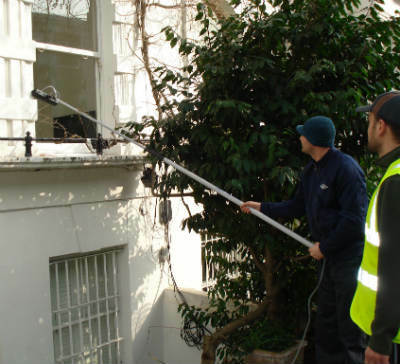 As our customer base expanded, we augmented our window cleaning in Belgravia to cover other London regions as well. Please go over our handy list to see which neighbouring locations we visit. Another quick and easy way to get a free instant quote or to book window cleaning services Belgravia SW1W is through our web site.